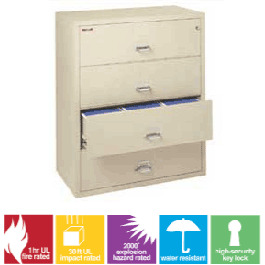 Made in the USA, the 4-3822-C four (4) drawer lateral fireproof file cabinet provides high security and fire protection. It carries both the UL fire resistance label and the UL impact label. This fire file will accommodate both legal and letter documents. Add DRYFile bags and make it waterproof! When you comapre FireKing vs. SentrySafe only Fire King has the UL 1 Hour & Impact Ratings, Medecco Key lock and powder coated finish standard on every file cabinet.